"Why Don't We Do It In The Road?" and other videos. 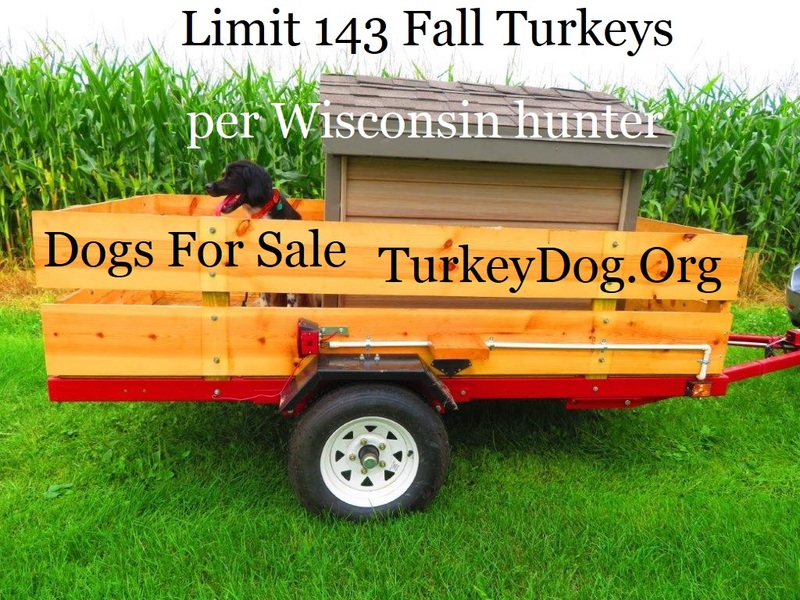 Those who like hunting behind big running bird dogs could never fill all 143 permits they can buy in Wisconsin at $10 each for the 4 month Fall season. Then run that dog once or twice a day for 3 months in the Spring. The best time to hunt turkeys is in the fall. 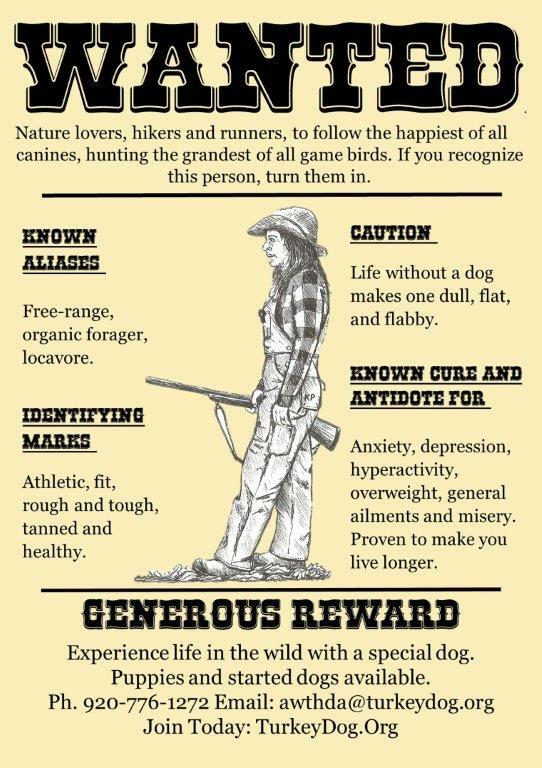 The best companion is a dog. NY, PA, TN, VA, WI, WV and Ontario. The best time to make a reservation is now. 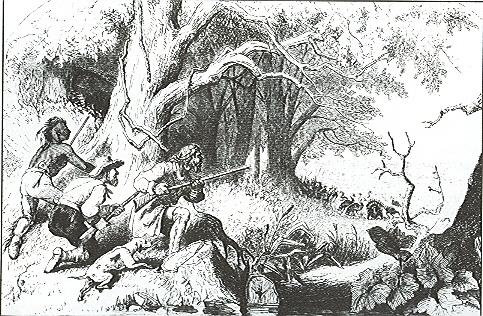 Hunting starts at the autumnal Equinox since ancient times. Wildlife fattened up in the Summer are ready for harvest. 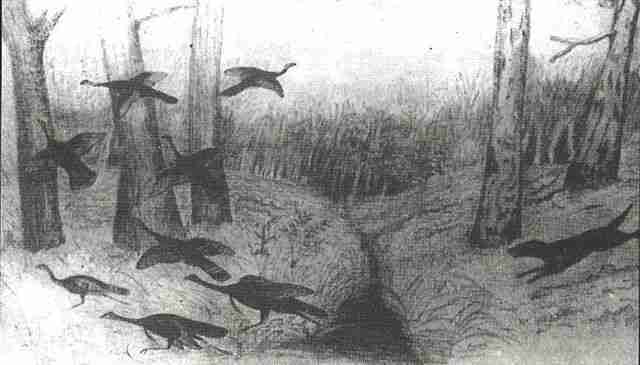 Fall turkey hunting with dogs began with the founding of Jamestown, VA in 1607. 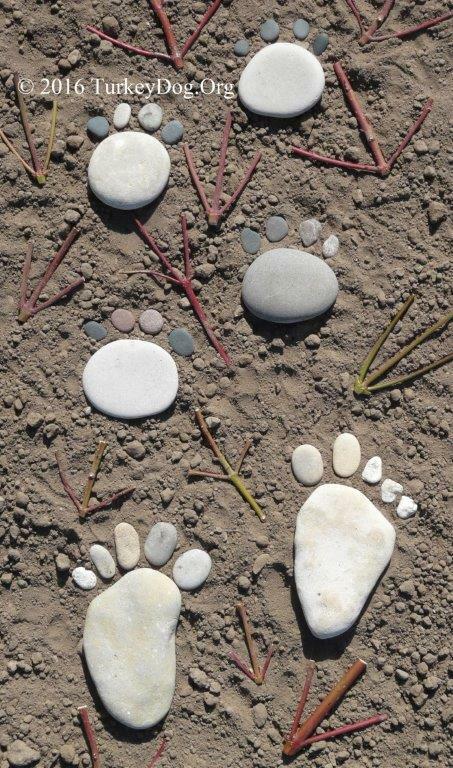 It's a family tradition passed down for generations (over 400 years). 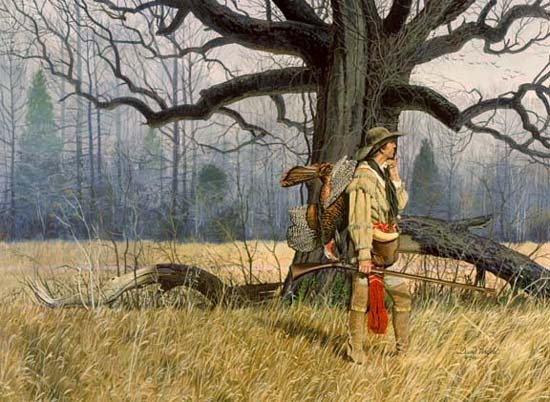 Hunting turkeys in the Spring is a contemporary invention, from the 1950's (AL), 1962 (VA), to the 1980's (WI). 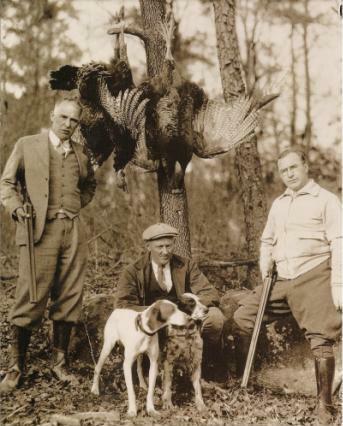 Archibald Rutledge and Henry Davis "thought it an abomination that people were allowed to shoot gobblers during the spring season and likened it to shooting fish in a barrel. 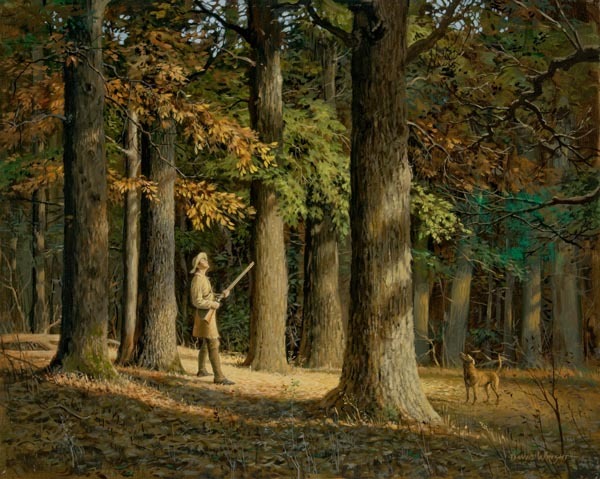 They thought it much more sporting to bust up a group of turkeys in the fall and call them back in and hunt them by stealth than use hen calls during the mating season to bring even wary old birds running foolishly to gun." That's why today we have hunters from 9 to 99 who never hunted turkeys in the fall, because all they've ever known was spring hunting. 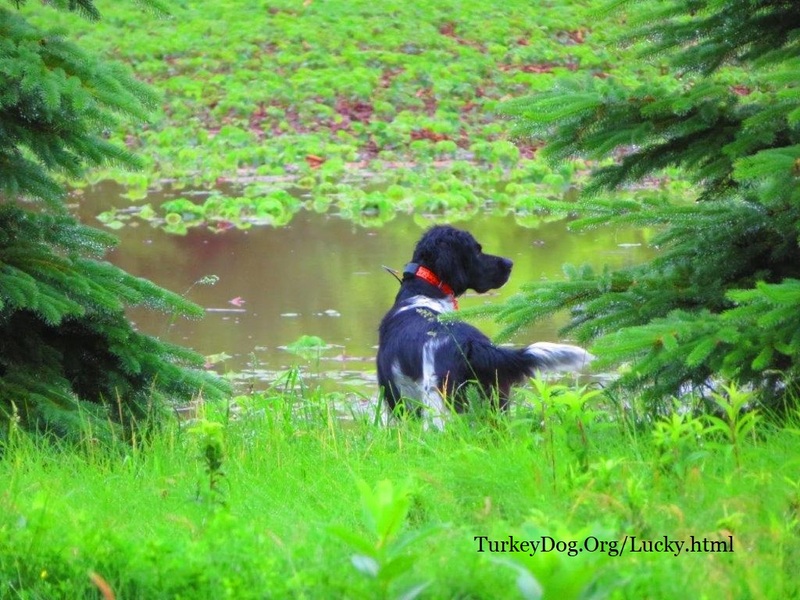 Turkey hunting with dogs: Keeping the tradition alive. on t-shirts and sweatshirts (bottom row). 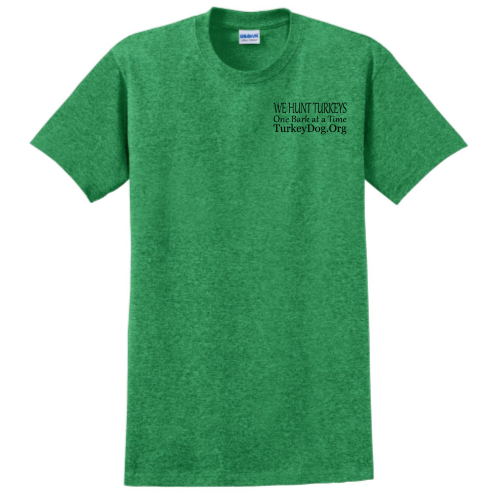 Children's sweatshirts and t-shirts by request. 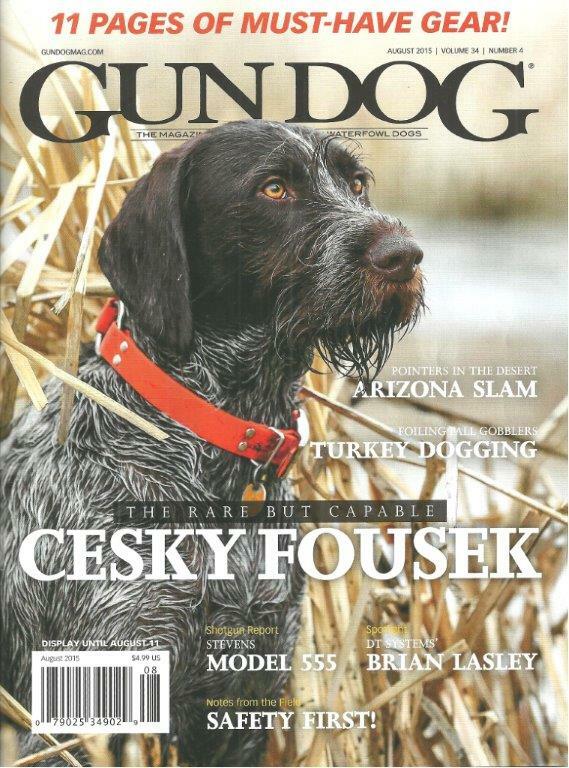 5th Printing of Choosing, training and hunting turkeys with a dog. Advanced Notice of available puppies (members only). Wolves from 15,000 years ago became Turkey Dogs. Our 2 Best Tools to Conserve Wild Turkeys. 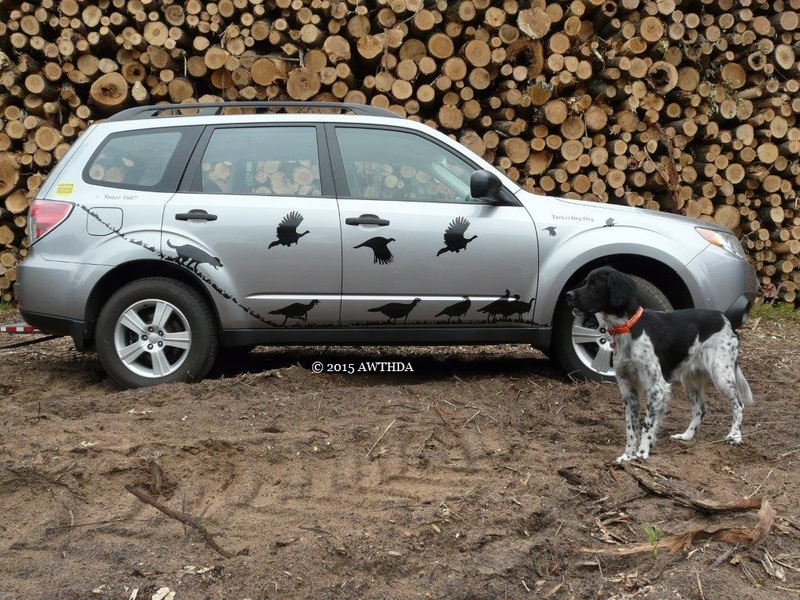 Run dogs in the spring, in the Sandhill Crane Protection Program. and thought to be critically endangered. 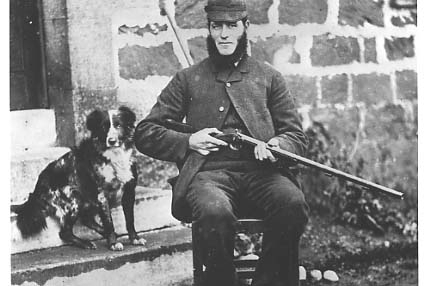 The first dog show in 1859 was all pointers and setters. 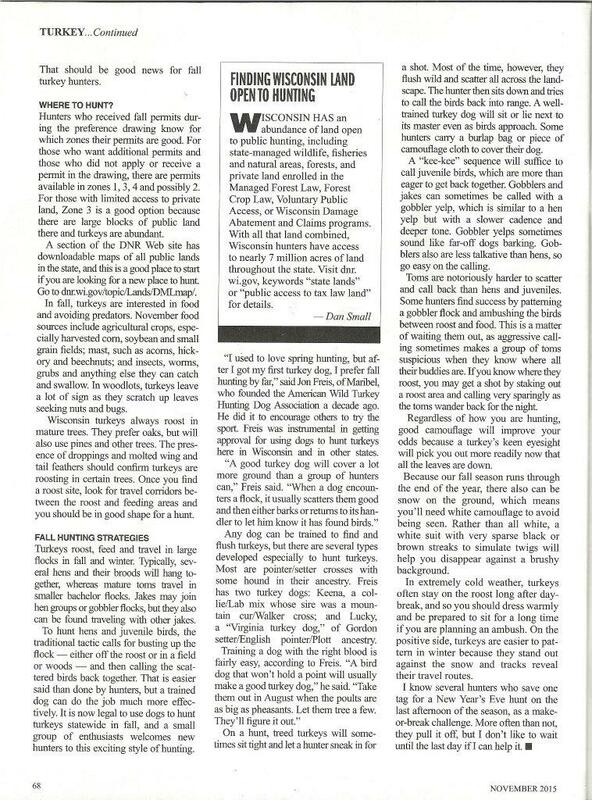 Wild turkeys saved Le Sier de Boisrondet, traveling with some of the earliest French explorers Sieurs Robert de La Salle and Henri de Tonti (Iron Hand), Fathers Gabriel and Zenobius, in Kewaunee county Wisconsin in 1680, before the Pottawottamie Chief Ononghisse saved them all. 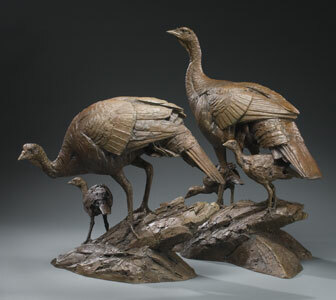 Members can read the remarkable story of how the wild turkeys saved Le Sier de Boisrondet. Always carry some rope, big zip ties and a short-nosed cable cutter. On New Years Eve, this dog flushes gobblers with ice beards in a creek near the Mississippi. Drones w/FLIR save turkeys from harvesters. 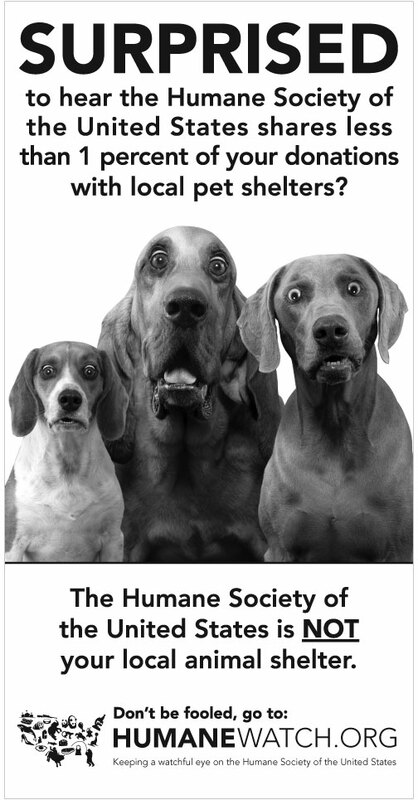 Surprised photo compliments of Humane Watch - WATCH LAWYERS IN CAGES. 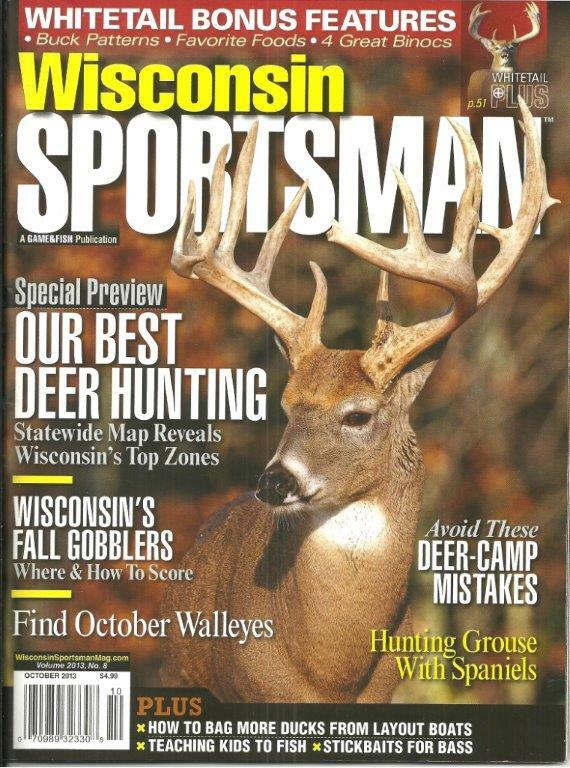 November 2015 WISCONSIN SPORTSMAN magazine. "The Neartic has a low diversity of birds in relation to it's area. 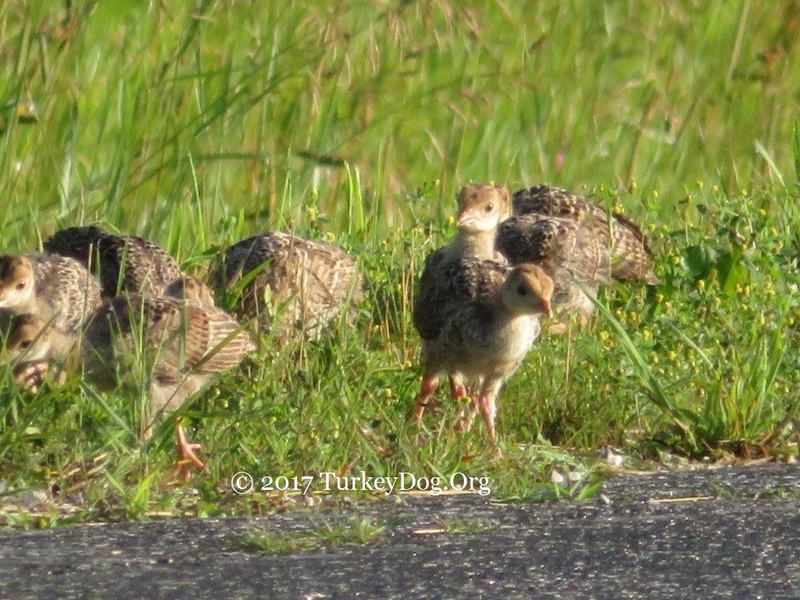 It contains no endemic families, although one very small subfamily, the turkeys... has one of it's two species - the Wild Turkey, Meleagris gallopavo - entirely confined to the Neartic. The other species in this subfamily - the Ocellated Turkey, M. ocellata - is endemic to the northern regions of the adjacent Neotropical region." Recent studies say some Birds are as smart as Apes: The cognitive skills of crows, ravens and other corvids are as sophisticated as those of apes, even though they have a much smaller brain. 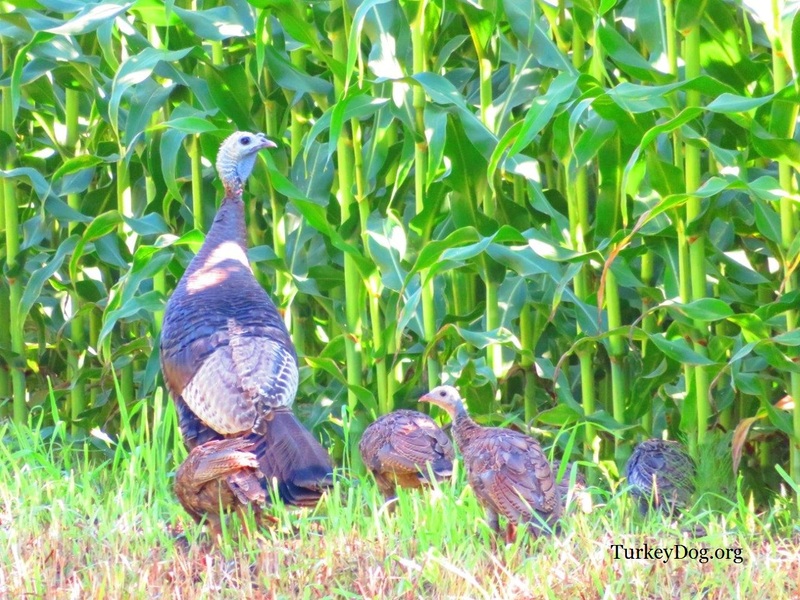 Wild turkeys skills are close to the corvids . ← Wisconsin's Fall Gobblers - Where And How To Score. “The way you treat your dog in this life determines your place in heaven”. 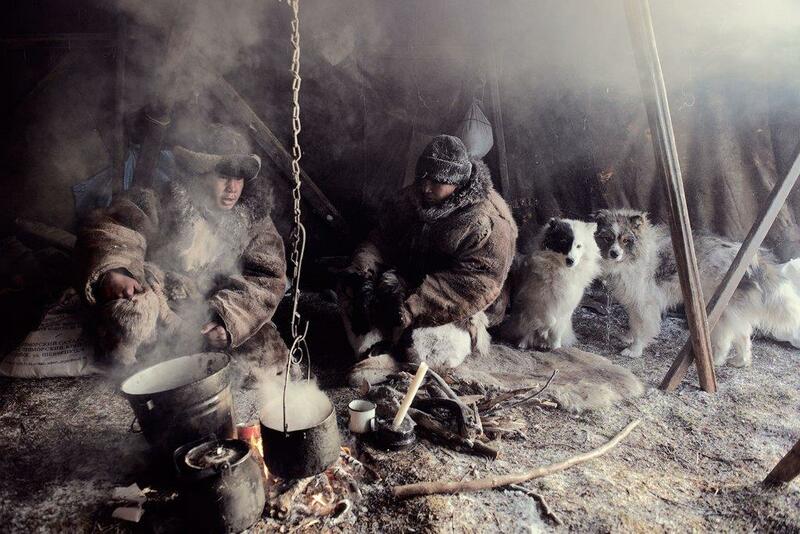 Chukchi, Arctic. Dogs helped the Gauchos of Argentina hunt wild horses and cattle since the 1700's. 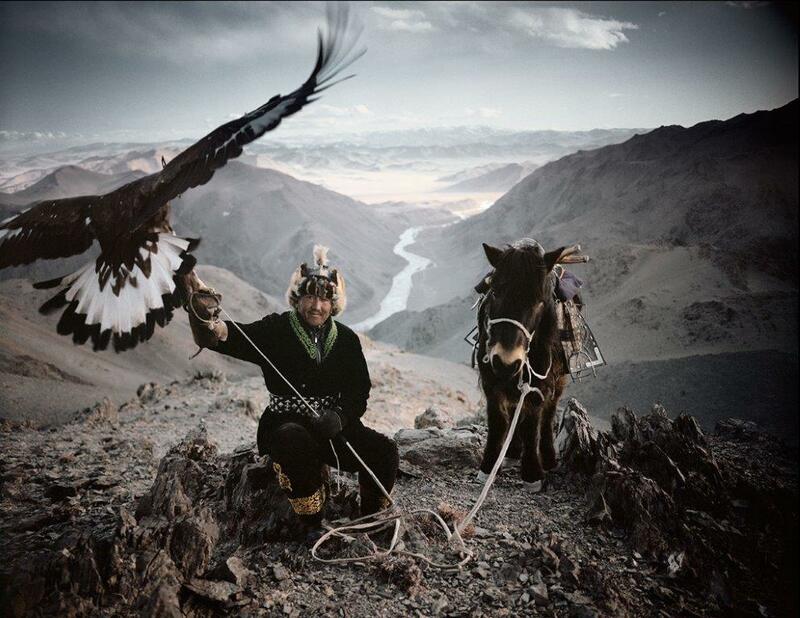 The Kazakhs of Mongolia hunt with eagle wings. 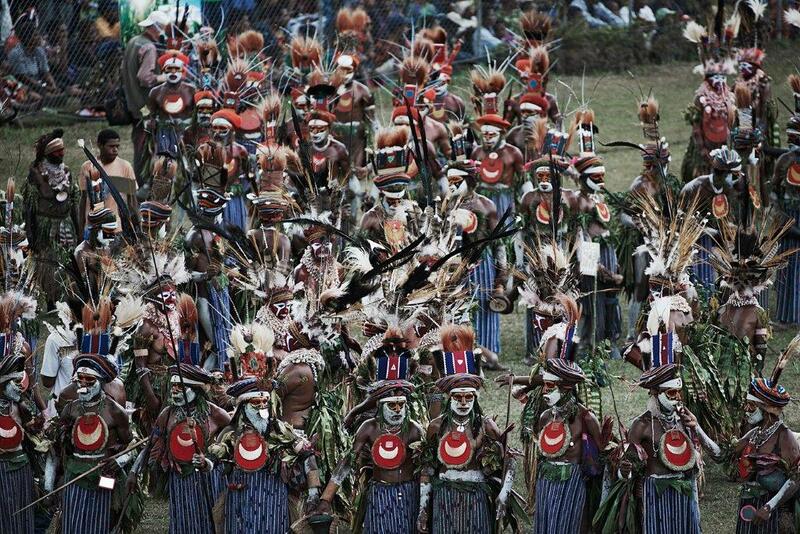 The Goroka of Papua New Guinea adorn themselves with bird feathers. 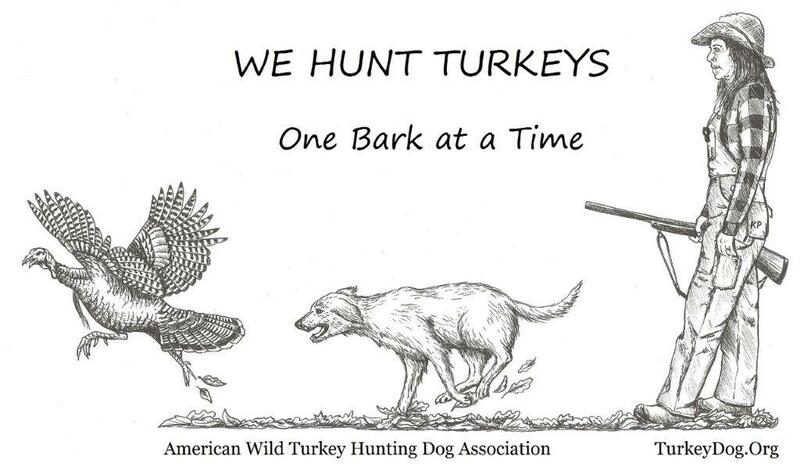 In America, we hunt wild turkeys with special dogs. Before They Pass Away by Jimmy Nelson, 408 pages. 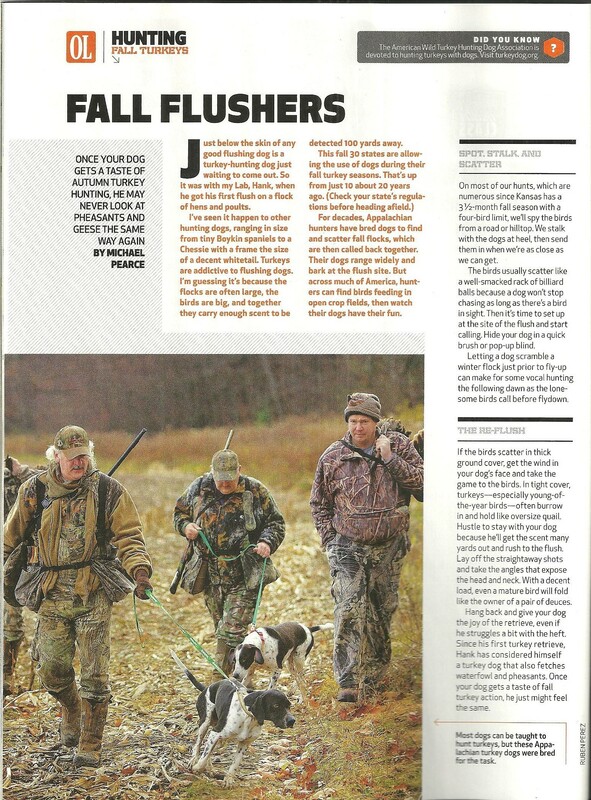 There's a few writers that explain why we love fall turkey hunting with dogs. Steve Hickoff is one. 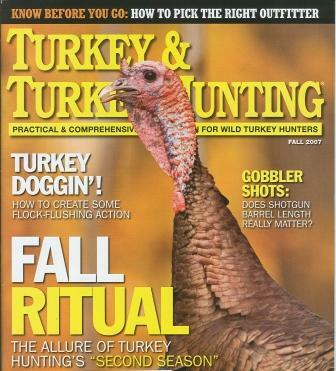 Read the Fall and Winter Turkey Hunter's Handbook by Steve Hickoff. 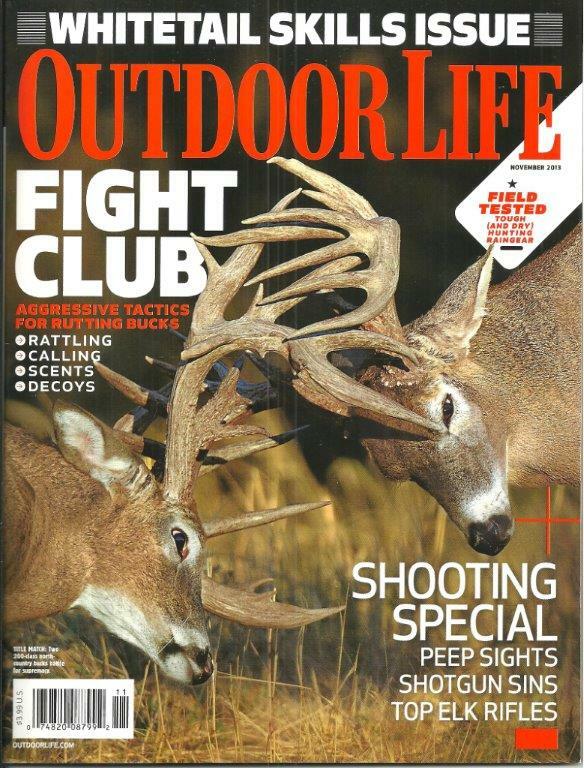 Read his contributions to Outdoor Life, in the StrutZone. 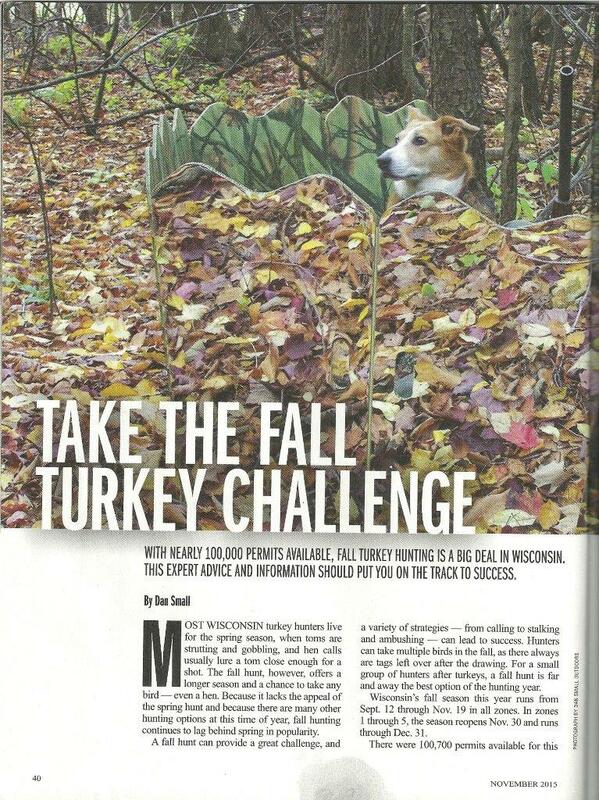 Fall and winter turkey hunting with your dog is an American tradition, and part of our nation's outdoor heritage. 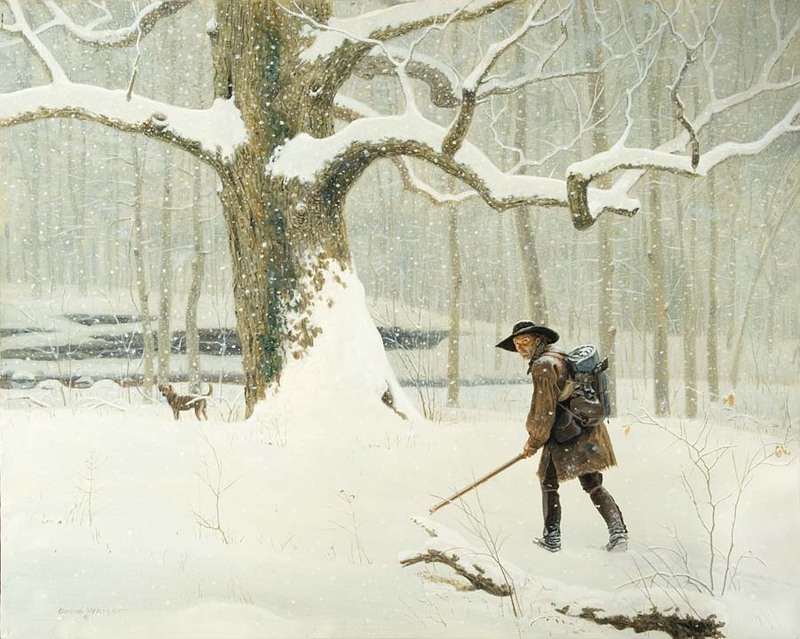 Americans have pursued wild turkeys in the fall and winter with their dog since colonial times. 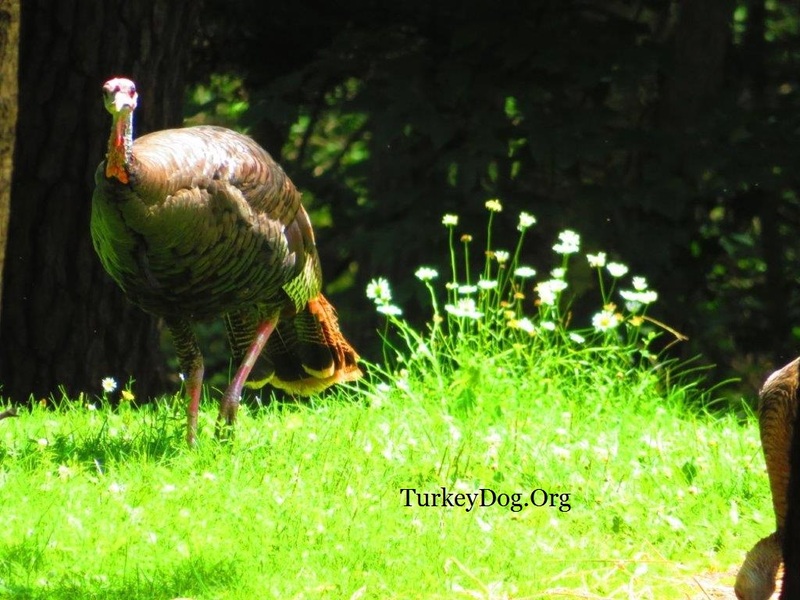 It has a much, much longer tradition than the spring turkey hunting that we know today (Montana, Nebraska, Utah, Tennessee, British Columbia, Alberta and Ontario allow the use of a dog to hunt turkey in the spring). 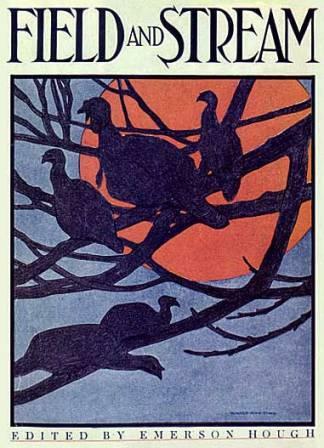 By 1900 the wild turkey had been nearly exterminated nation-wide. This was due to the pioneers and the market hunters, plus the wide-spread habitat destruction - cutting the forests and clearing the land. 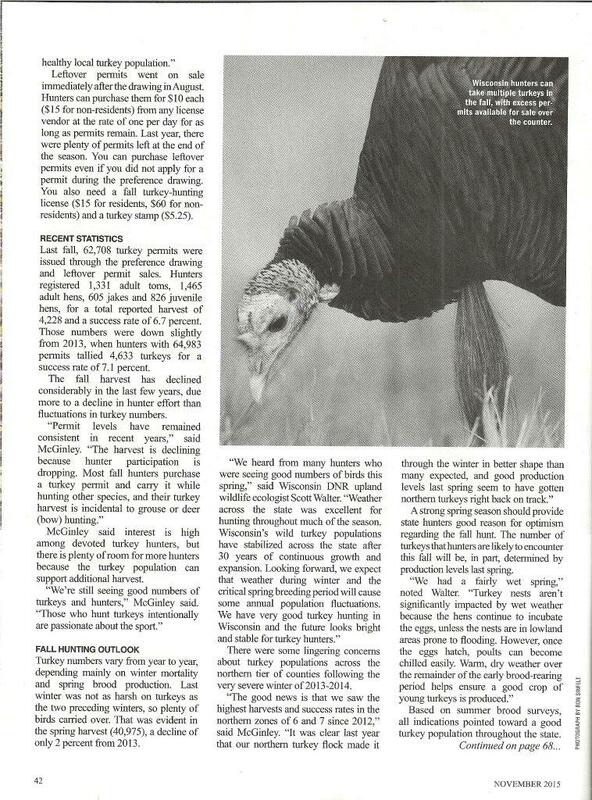 In 29 States and 3 Provinces, science proves hunting turkeys in the Fall and Winter makes you and your dog live longer. 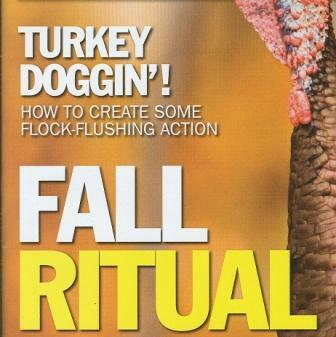 Since discovering that turkeys respond to calls that sound like a Rusty Barn Door Hinge™, spring and fall turkey hunters have combined their love of dogs, and the call making craft. In spring, hunters might lure love-sick gobblers with a simple cluck or hen yelp. 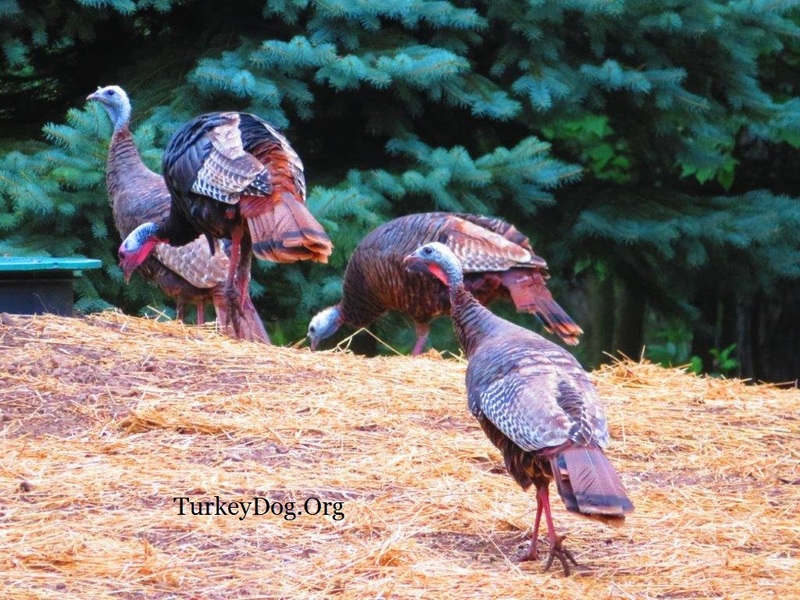 During the fall and winter hunt, good calls are as important as a good dog, especially the keekee, yelp and gobble. 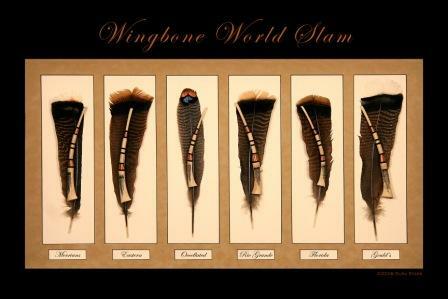 Durk Stark contributed the center picture below of his traditional wingbone calls. 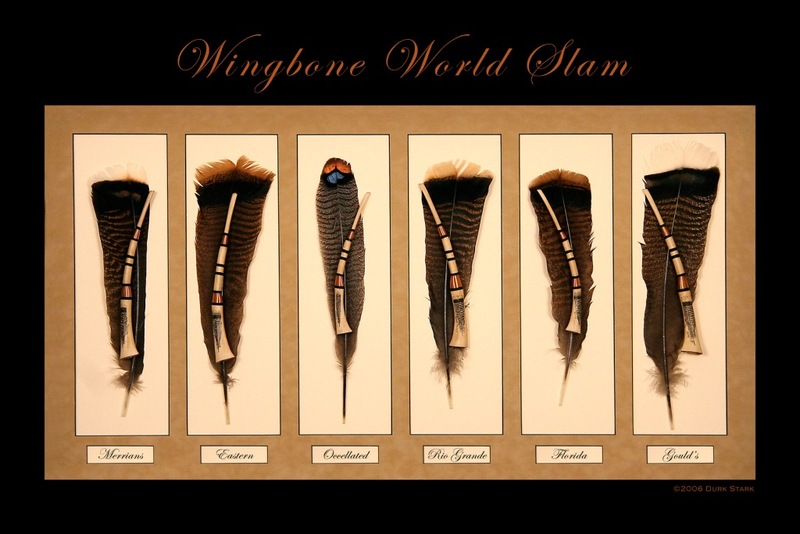 Each feather and matching wingbone call is from a sub-species of the wild turkey, and the drawing on each bone depicts that particular sub-species' feather. 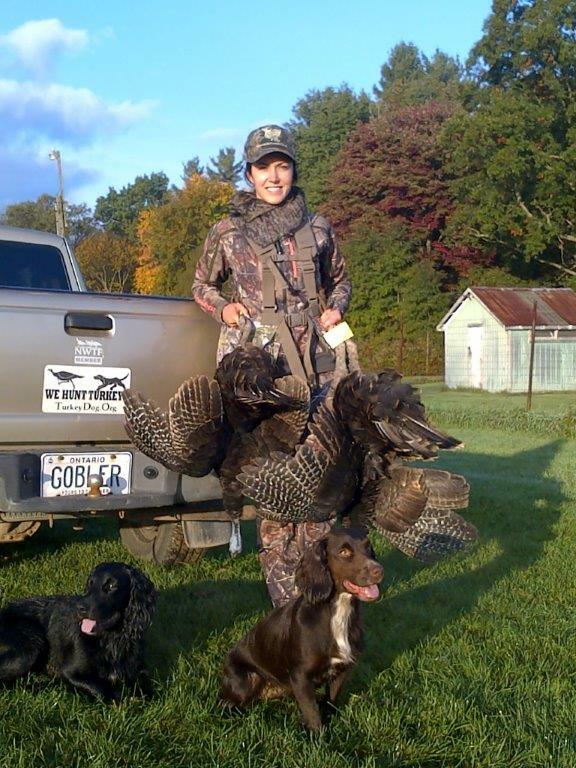 While some hunters wait in ambush, shoot flushing birds, or conduct drives, by far the most exciting method is scattering the flock with a well trained dog, and then calling a turkey back in. The wild turkey is capable of out-running a galloping horse in a short sprint, so hunters rarely scatter flocks by running at them. 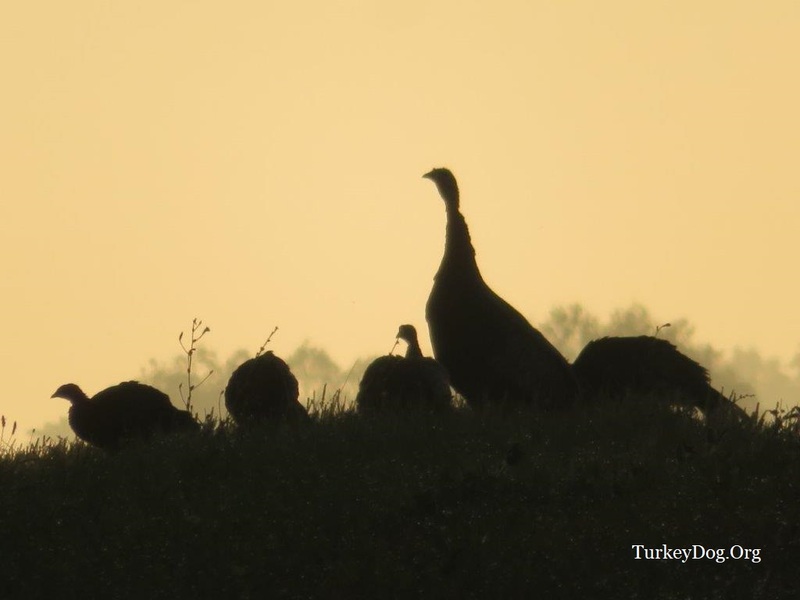 "Some hunters, or rather some writers, claim that the only time the wild turkey should be hunted is in the autumn and winter, and not in the spring. I have a different idea all together, and claim that the turkey should not be hunted before November, if then, December being better... 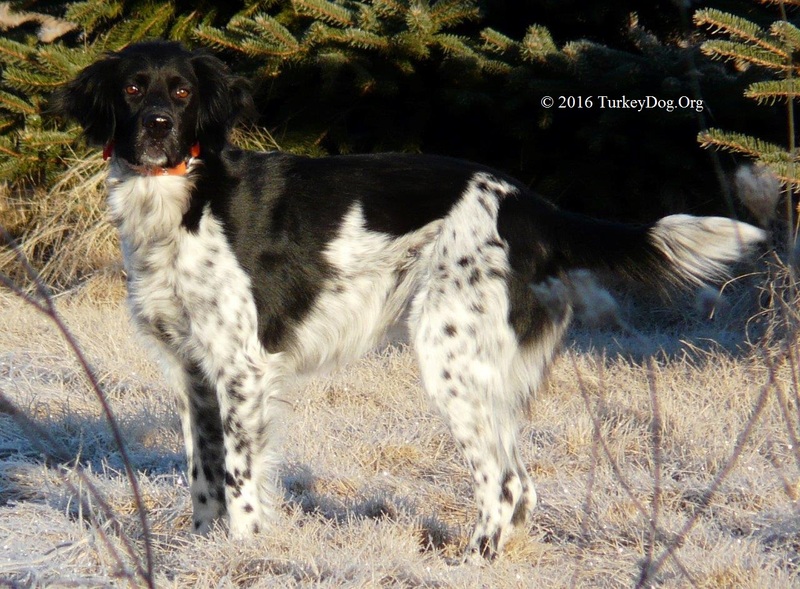 I do not believe there is any safer way of bringing a turkey to bag than by the judicious employment of a good turkey dog, and by that I mean a dog trained especially to hunt turkeys." Chas. 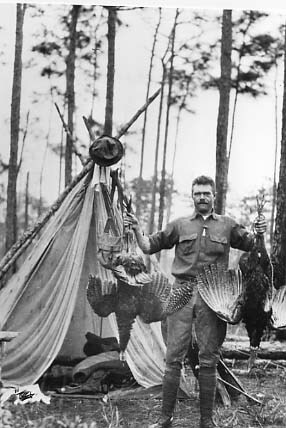 L. Jordan, quoted in The Wild Turkey and Its Hunting by Edward A. McIlhenny, 1914. Available from Real Turkeys. by Jon L. Freis - Fifth Edition, Revised March 2018. 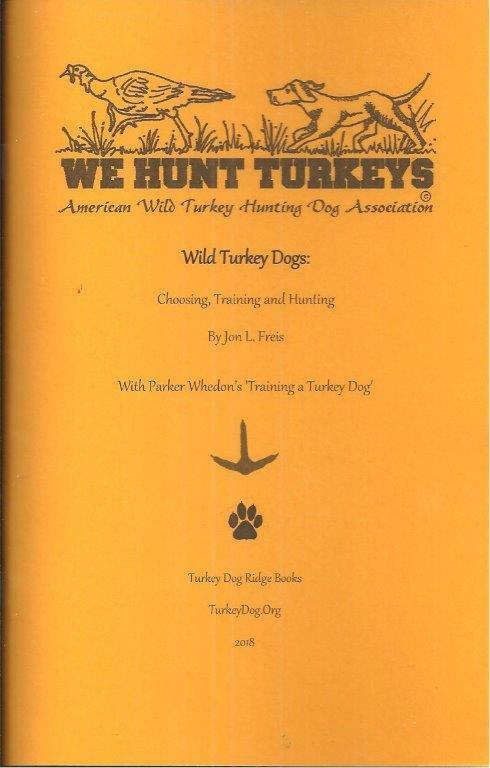 Includes Training a Turkey Dog by Parker Whedon, secrets of the old days, with contributions from 100's of turkey dog hunters. Order here. Become a member and get the book included, only $30.00 click here and buy #1. Traveling with your dog and need to know which motel or hotel chains are pet-friendly? PetsWelcome.com has the best listing we've found. Concerned your dog is over-medicated with unnecessary vaccinations? The Rabies Challenge Fund is changing the rules. 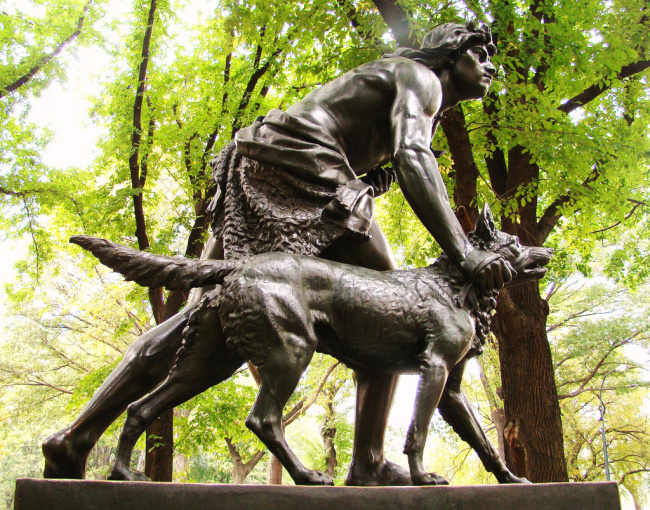 The Center for Disease Control says, since 1995, there's been no reported cases of human rabies from an indigenous dog. 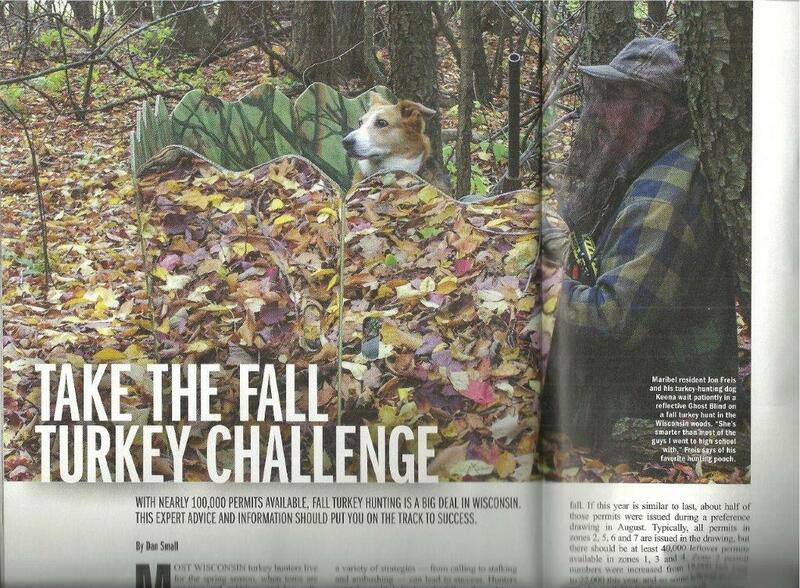 Parker Whedon is a legend among turkey dog hunters, and shares 50 years of memories with us. 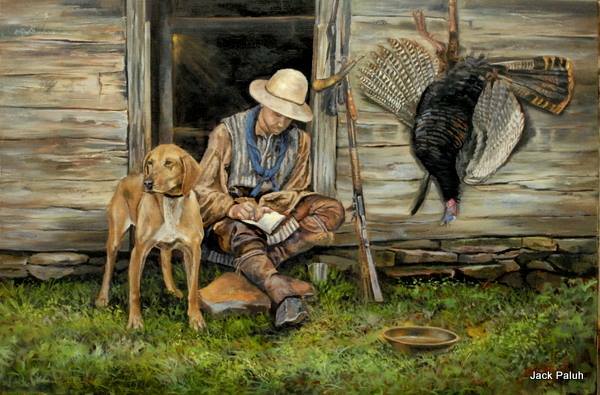 <<< Click on picture to the left - it speaks volumes about a turkey dogs passion for the birds. Complete story. 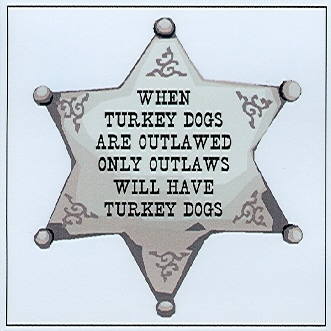 In British Columbia, the Vancouver Sun reports that dogs are no match for the wild turkey: "Those turkeys are smart enough that they almost outrun the dogs and don't take flight until the dogs are two or three feet behind them." Watch Keena's flush and you'll see one turkey on the left not take off until she almost caught it! 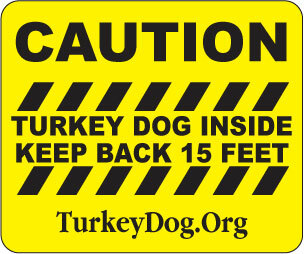 Turkeys would always rather run than fly, so it takes a good dog to get them all off the ground. Turn up the speakers! Hit the PLAY button over and over! This is truly rare footage. Unless you've tried it, you have no idea how hard it is to capture video like this. Keena barks at her turkeys! 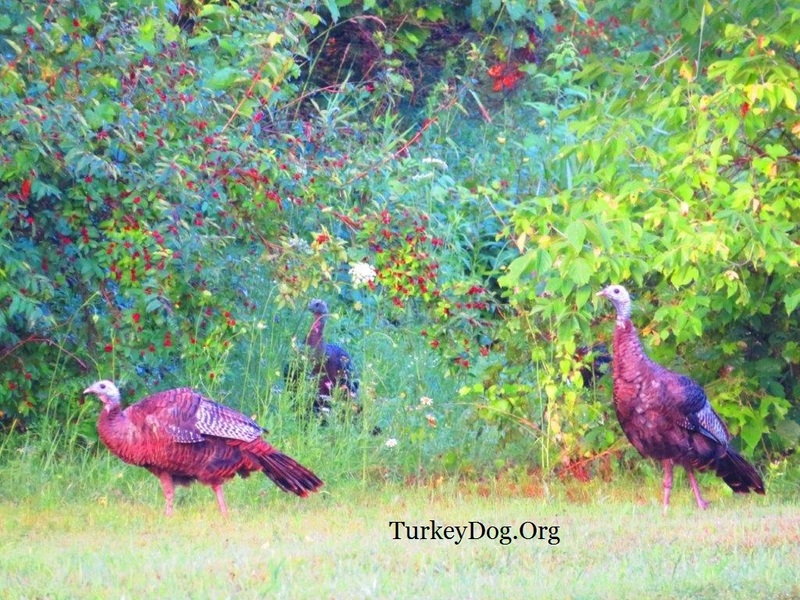 Because the turkeys are so wary, and the dog is so fast, the photographer never gets near the flock. 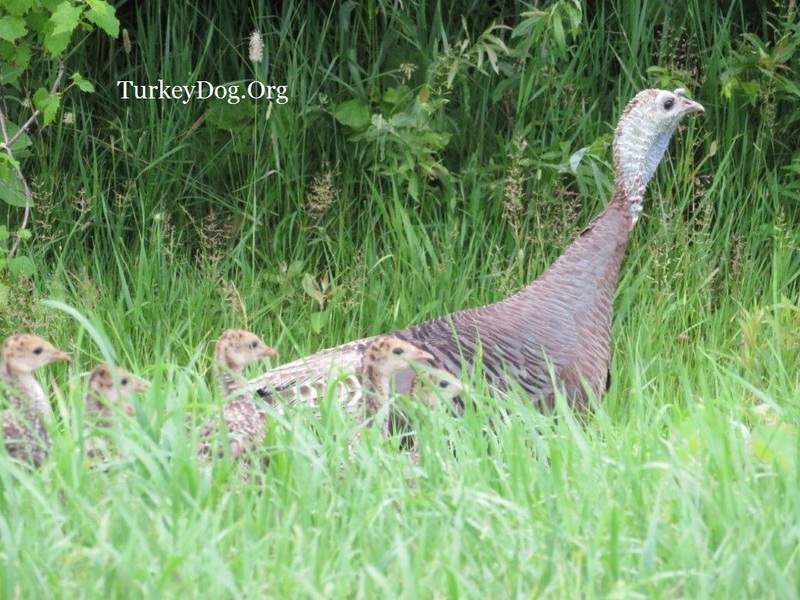 50% of turkeys born in spring don't make it through the next winter. Mississippi statistics show a fall harvest of 5 to 10% of the fall population is acceptable. Now Missouri biologists say: 'the fall kill could be fifty percent of the spring kill, without compromising the population. 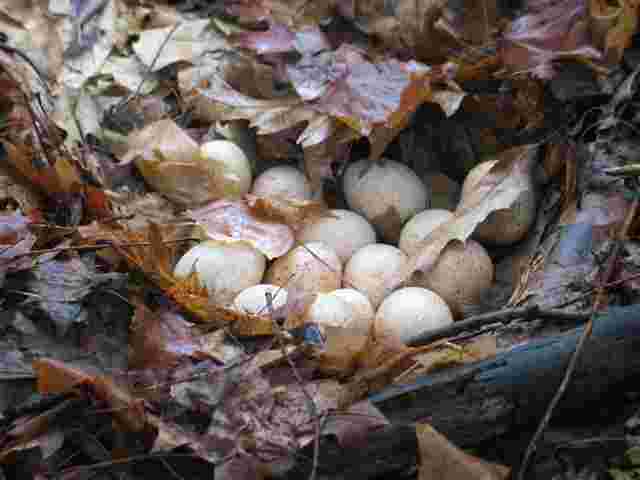 "A mean life expectancy of 1.3 to 1.6 years, and average annual mortality rates of 76% (WV) and 60% (FL):"
"Only about 15% of the eggs laid live to become poults 2 weeks of age. Only a few birds live to be four years old." 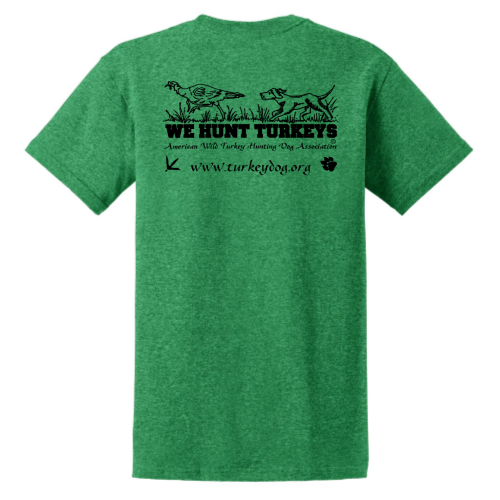 and the leading organization working to allow fall turkey hunting with your dog. 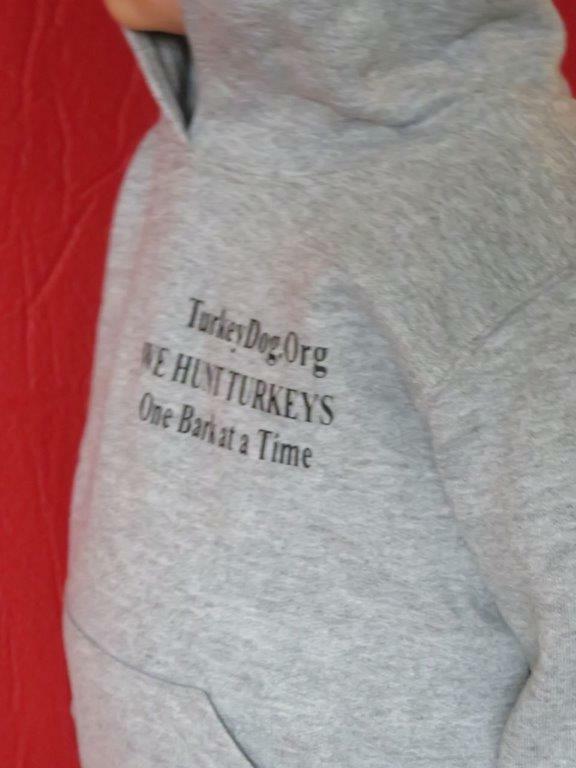 If you're a fall turkey dog hunter, don't be a fence sitter, make a contribution. We are firm believers in fair chase. 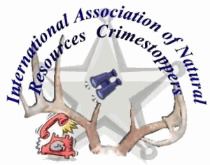 Click on the IANRC logo at the right to turn in poachers. 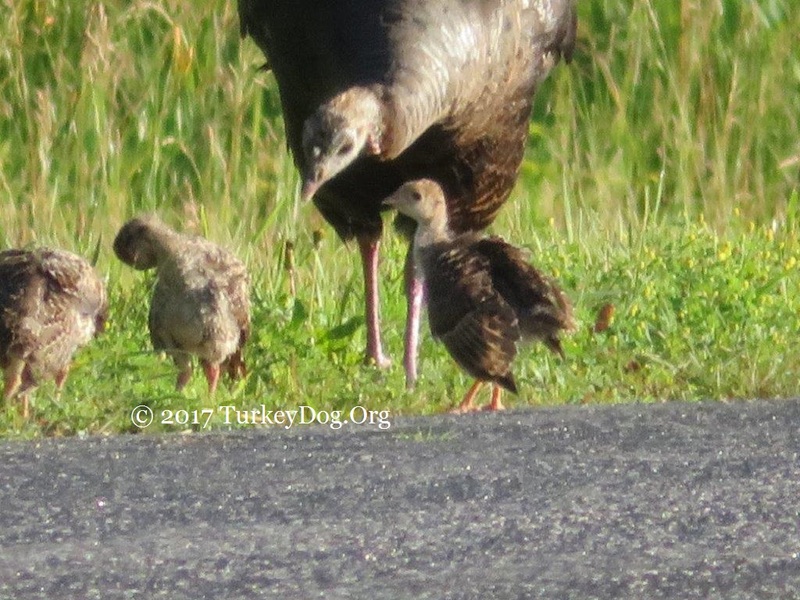 "The wide ranging dog that barks isn’t necessarily needed anymore, primarily because urbanization has destroyed so much of the turkey's habitat. I used to be able to hunt 500 acres, now it’s closer to 50. I have a friend who's dog didn’t bark, so he used a bell, and you could tell what the dog was doing by the sound of the bell. We believe the best dog is the one that suits you." 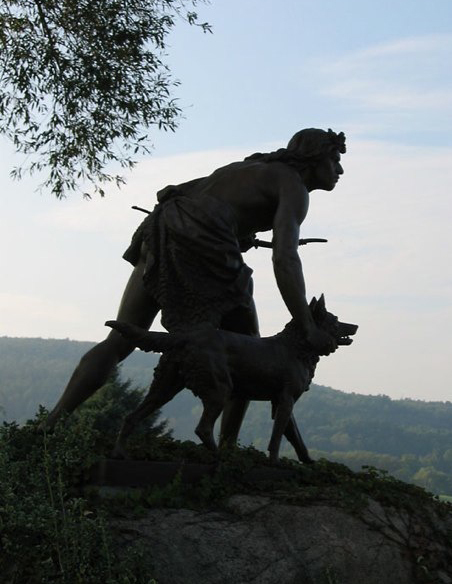 Ed Morris - Charlottesville VA.
Take the motley mongrel 'Jack', the best leader of 156 dogs, who broke trail for 1300 of the 1400 miles Admiral Byrd made on his Antarctic Expedition, in A Dog's History of America. The dog scattering the turkeys photos courtesy Chris Dorsey & Howard L. Harlan. 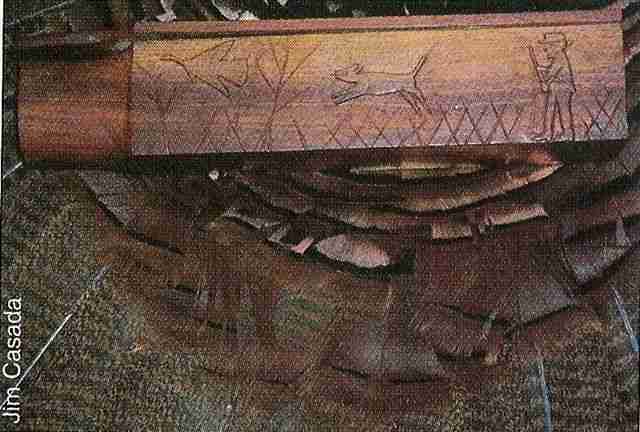 The vintage box call with the hunter, a dog and a turkey was used by Simon Everitt about 1915, courtesy Jim Casada. 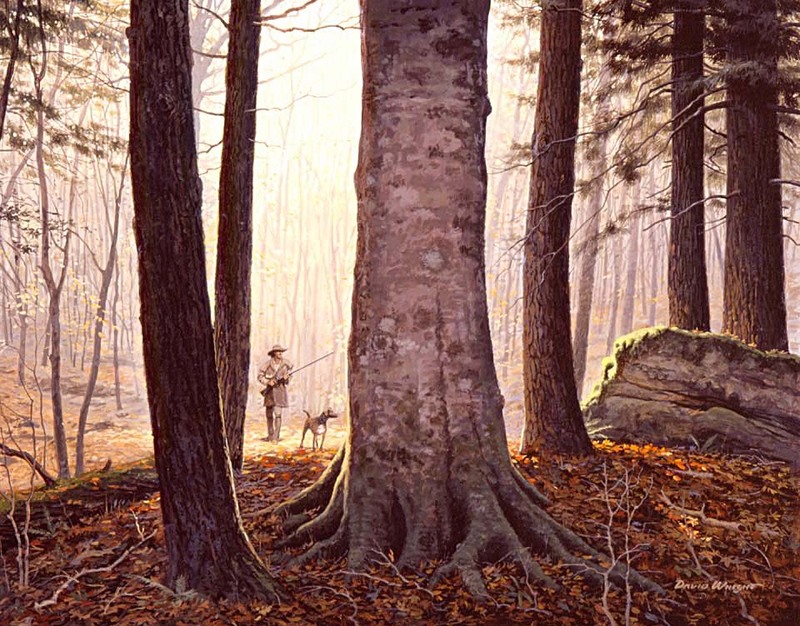 Hear samples of authentic wild turkey calls recorded in the fall and winter woods. Replace the above ad with yours- inquire within for multiple advertising opportunities. This website began May 30, 2004, last revised March 29, 2019. Best viewed on a computer, with your dog by your side. Search this site with DuckDuckGo below - read about them here.